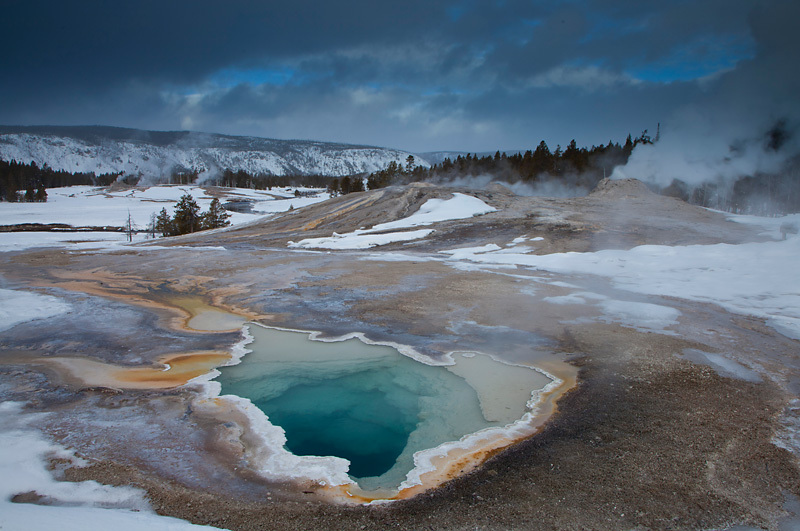 ﻿﻿﻿Having come to the end of the first of two Northshots photo tours to Yellowstone and the Tetons I’ve had a little time to reflect on our time in the white wild West of America and download my images. I’m out here with my esteemed (hmmm) colleague and co-guide Peter Cairns who will I’m certain, reflect candidly about ‘American absurdities’, over-specced vehicles, cappuccinos and the mountains of food thus-far consumed, so I’ll leave that to him! Its been a long time since I was last in Yellowstone and whilst the number of visitors may have increased significantly in summer, the winter season here is just as I remember it – the crowds have long gone, the roads are largely car free and the interior of Yellowstone feels very much like the wilderness that it really is away from the tarmac. 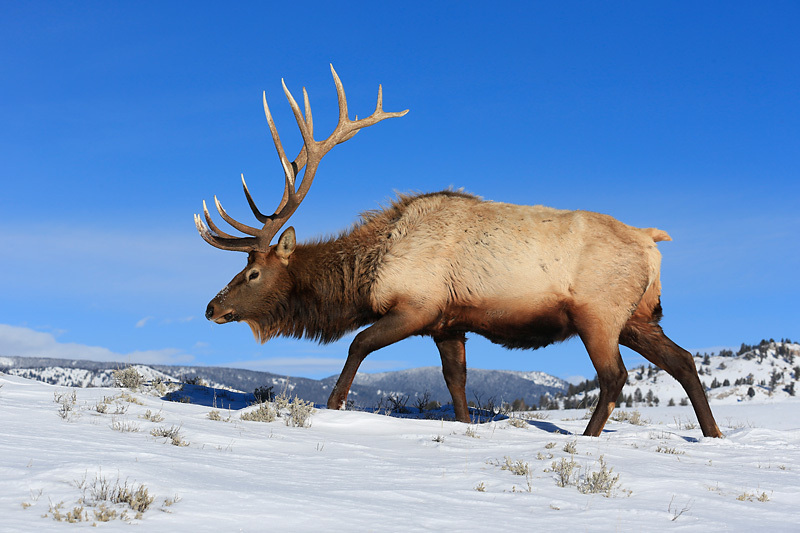 Winter is unquestionably a special time to visit Yellowstone – a time when the Park is enveloped in a simple white mantel that provides the perfect backdrop against which to photograph the hardy creatures that remain. 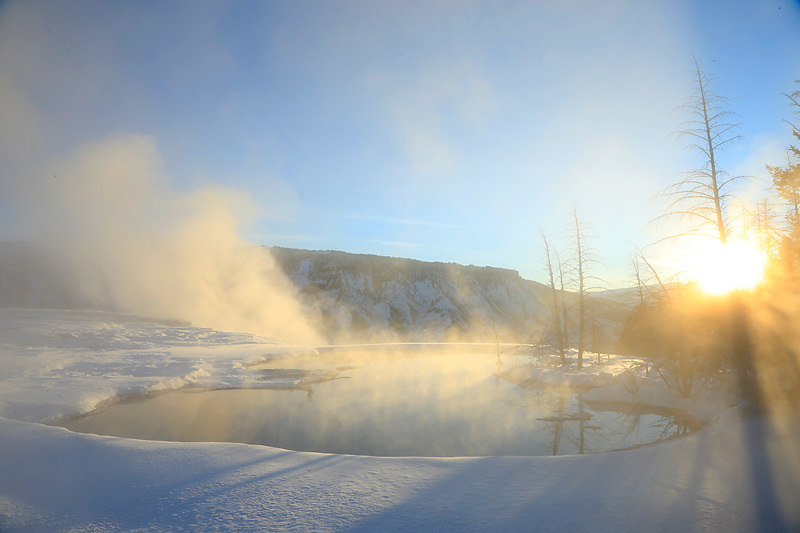 Like most of America, Yellowstone is a land of contrasts and at no time is this more apparent than during the winter season when the geysers for which the Park is famed, spurt forth giant columns of steam into the frigid air that coats any nearby surface with thick layers of hoar frost. 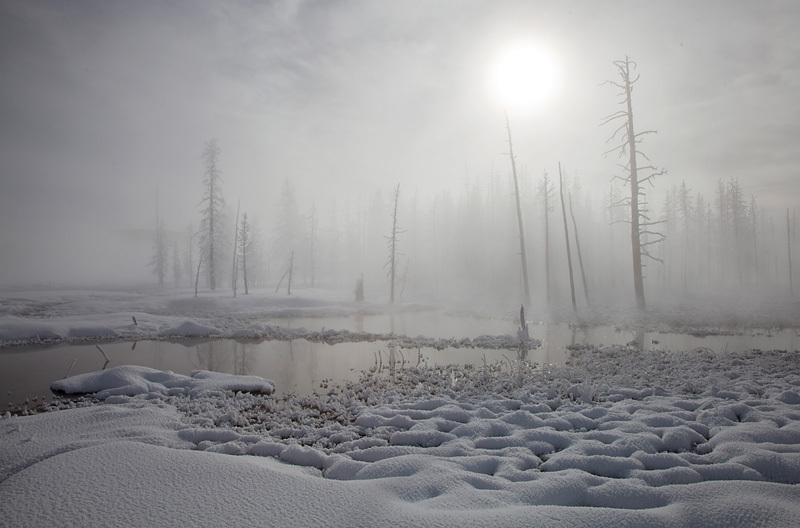 Such conditions are a photographer’s dream and we enjoyed one such magical morning of freezing fog, pristine frost and sumptuous light on our first day in the heart of the caldera. There were great pictures in every direction, where just 24 hours before the area would hardly have merited a second glance. 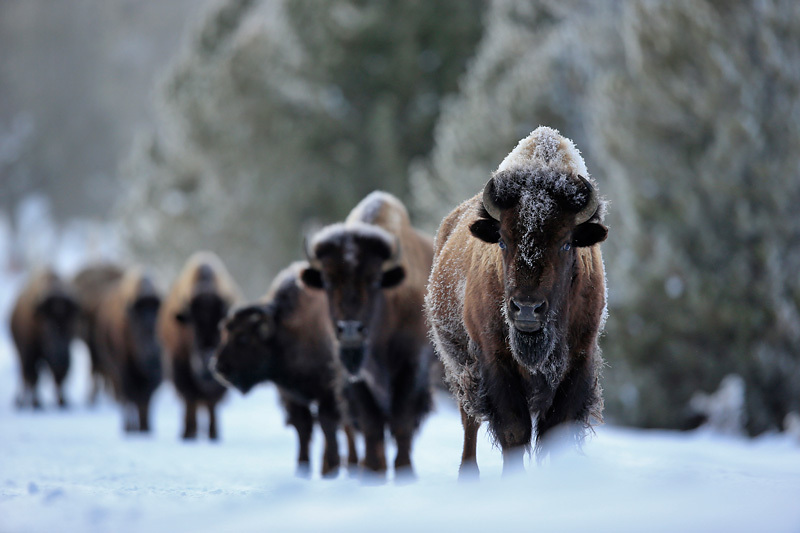 This frantic session was quickly followed by another as we encountered a huge herd of bison, at first barely visible in the thick fog but as it lifted it revealed a stream of these mammalian bulldozers plodding purposefully through deep snow. After securing shots of them against the steaming geysers they made their way towards the road honing in on us until we had to make a hasty retreat back into our snow coaches to allow them to pass. 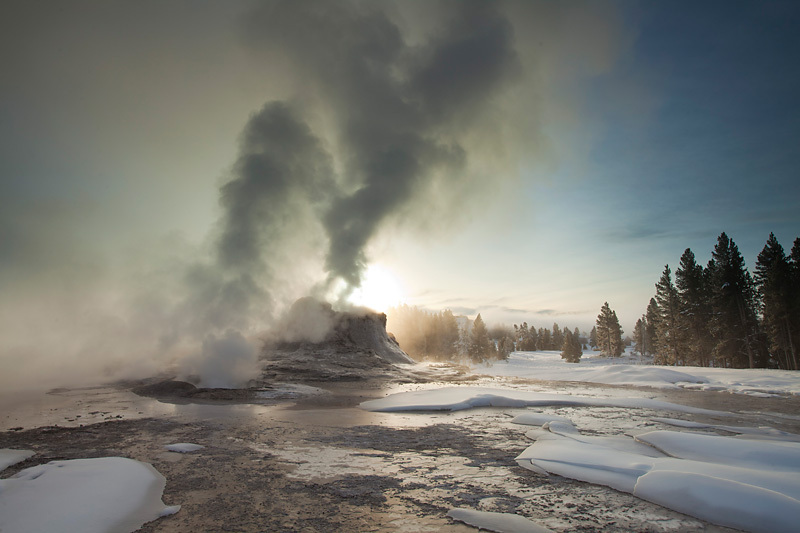 A day on foot around the Upper Geyser Basin with ‘Old Faithful’ at its centre is a must on any trip and the day began at dawn in the hope of a colourful sunrise over Castle Geyser. This didn’t quite materialise as we had hoped but I stayed a little longer- missing breakfast, for which my stomach was grateful – to catch the sun breaking through. 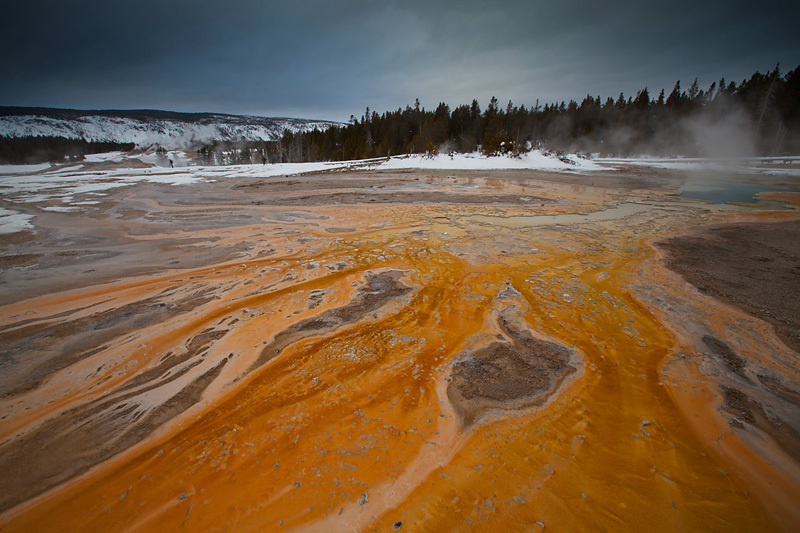 Later, the walk around the many and varied geothermal features produced some interesting images that worked surprisingly well in the overcast light. 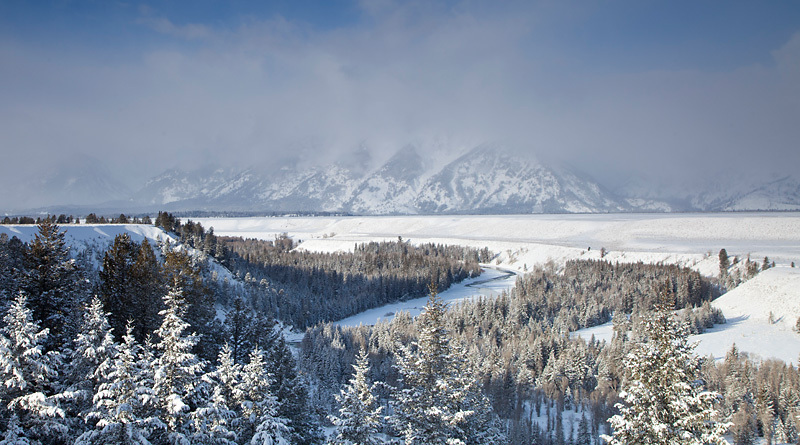 It was then on to the Tetons – a major undertaking in winter as it involves a (very) slow snow coach transfer followed by an 8 hour drive north, west, south and east to reach our base in Jackson. This was compounded by the fact that we had to swap one of our vehicles for something even bigger in order to accommodate our guests expanding waistlines – well in truth it was the ridiculously small boot and volume of luggage that was the problem. Anyway, having taken a longer route than we needed to and then negotiating a snow-covered precipitous mountain pass we duly arrived safe and sound if somewhat relieved. All was forgotten the following morning as we enjoyed a fantastic early shoot at Oxbow Bend, reassuringly deserted of the rows of photographers that are festooned here in autumn. 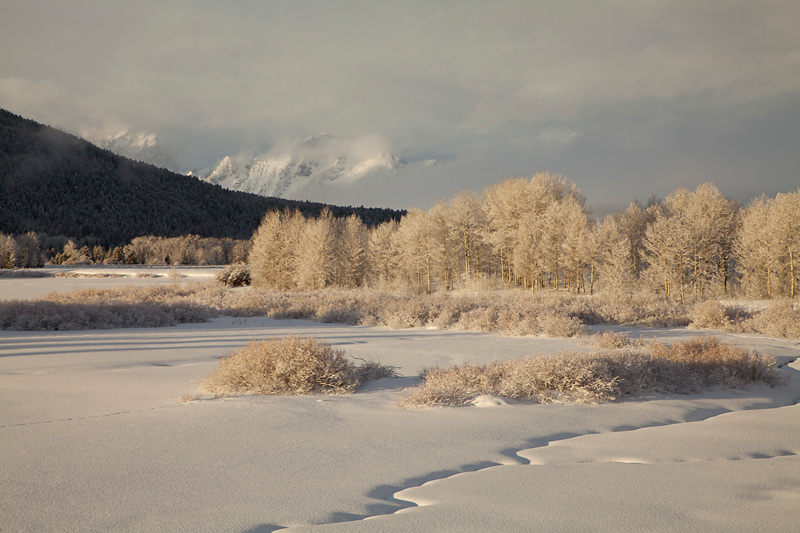 Just up the road moose browsed amongst the willows as the early morning sun illuminated the high peaks of the Tetons. 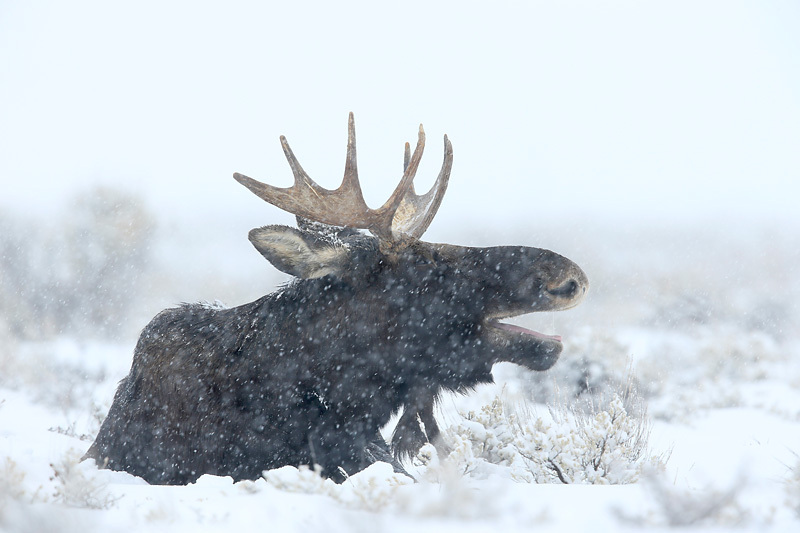 Moose were very much the mammal of the Tetons and on one of our days here we encountered no fewer than 20 individuals. Along the way we came across a host of other wildlife including coyotes, red fox, elk, bighorn sheep, trumpeter swan and much evidence of otters and wolves. Sadly the latter eluded us on this occasion as did the bobcat that had been spotted several times along the Madison River. But the trip was none the poorer for it and simply illustrates the point that nothing can be taken for granted and provides the incentive for another trip, which as it happens we’ll be starting on Friday. It’s a tough life! Many thanks to Chris, Pauline, John, Pauline, Shiela, Mark, Jim, Val, Ruth and Julia for your company. Stunning images Mark. 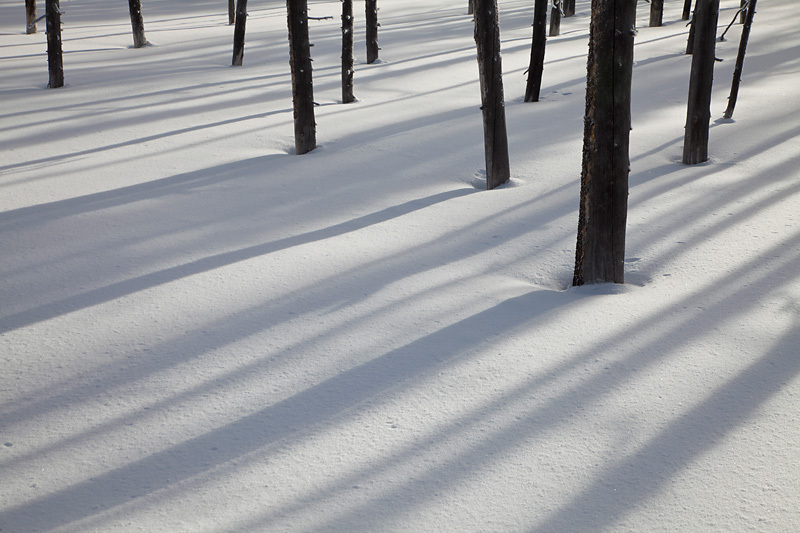 My personal favourites are the herd of bison with selective focus and the monochromatic abstract of tree trunks against snow. Looking forward to seeing loads more. Enjoy your trip! Thanks, Ian. About to set off on round 2 this morning. Thanks for sharing, a great series which apart from wetting peoples appetite to make their own visit has no doubt brightened their own day back home. And what a variety of images to share…provides the right flavor. Hope the coming week will be as fruitful for you. These are absolutely fantastic photos. I can’t wait to see the rest… and I’m really interested in hearing more about these ‘American absurdities’. Having returned home to a virtually ‘tropical’ Heathrow at 9C, it is great to see your first edit Mark. 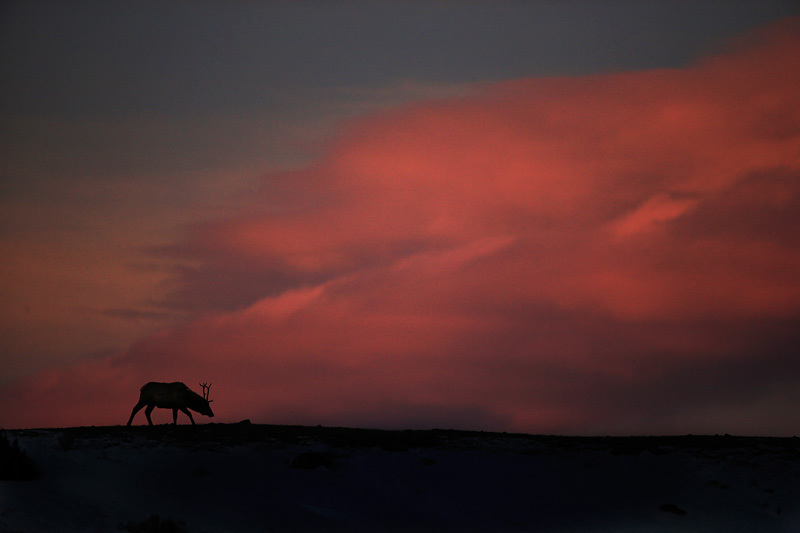 The elk against the pink sky at Mammoth did work! Wow Mark. Quality pictures as usual. 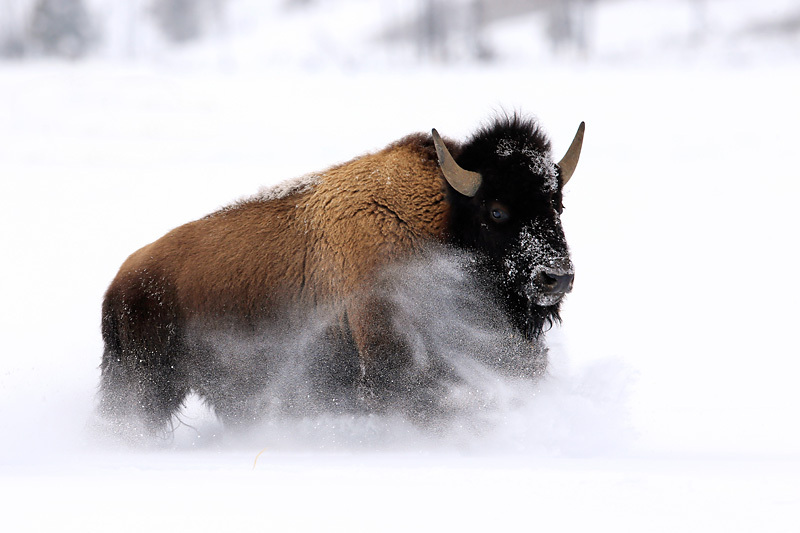 Bison has long been on my bucket list after the Musk ox. Seems that the winter is the time to go, seeing as I dislike crowds. Is this going to be a regular trip for you bloke. Hi Wayne. We have a trip here next winter which is full and are already thinking about a return in 2015 so keep an eye on the Northshots website or drop Pete/Amanda an email about your interest. Cheers and hope all well with you. Hi Paul. Thanks. Not much processing done. These are jpegs out of camera mostly. Mix of EOS 1DX and 5D mark II. Thanks, OM. See you soon. Look forward to it.